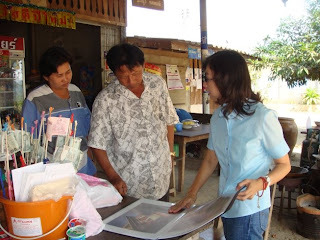 Kris is showing Phuyai “headman” the completed pictures and layout of the Tara Great Stupa. 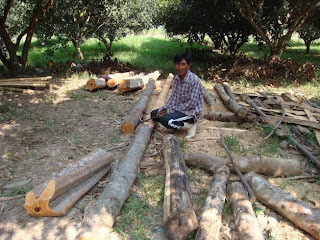 Na Lerd is preparing wood for the renovated Mantra Stupa. Kris, Na Lerd and Chang Nid (the smallest but most capable) and Na Lerd’s family. Na Lerd is a devoted follower of Kuan Yin. 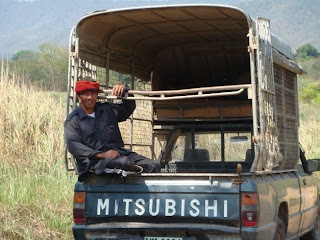 Na Lerd in the Foundation’s pick-up truck given by my older sister Karuna Nonthiwatwanich. 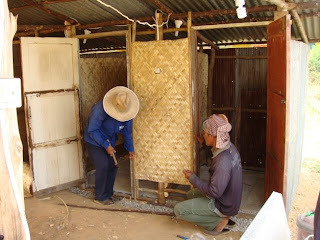 The workers built temporary toilets before the Guru Rinpoche Retreat in January. I just got back from Khadiravana. Although it’s a short trip, it’s always a rewarding experience. 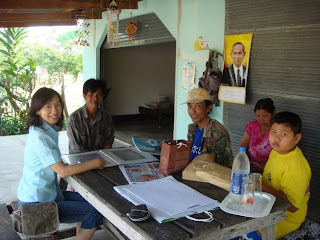 This time I had an opportunity to have a long conversation with the workers and the village headman and his family. Everyone expressed their great interest in working with us and helping us build the Tara Great Stupa. The officials at the district level also rejoiced in our project. Their great heart gave me a lot of courage. I thank particularly the workers who have worked tirelessly these past two years. Because of their skill and Khun Prachum’s coordination, Khadira forest has become a little Tibet in Thailand, a sanctuary and home to many people and animals. I made a vow on behalf of the Thousand Stars family that I will do my best to improve the quality of the workers’ lives. We will do whatever we can for the sake of the people in the community and for the sake of nature and environment.